Nell knows a secret about her perfect, beautiful sister Layla. If she tells, it could blow their world apart. When Nell and Layla were little, Nell used to call them Nellaya. Because to Nell, there was no difference between where she started and her adored big sister ended. They're a unit; divorce made them rely on each other early on, so when one pulls away, what is the other to do? But now, Nell's a freshman in high school and Layla is changing, secretive. And then Nell discovers why. Layla is involved with one of their teachers. And even though Nell tries to support Layla, to understand that she's happy and in love, Nell struggles with her true feelings: it's wrong, and she must do something about it. 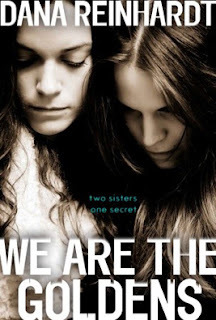 I liked the writing in We Are the Goldens. The story is written as if Nell is speaking or writing to Layla. It flows easily, in a conversational tone. The tone combined with it's relative shortness (~200 pages) allowed for a quick and easy read. I enjoyed the story, although I did expect more than I received. The biggest letdown was the ending. I didn't like that things were left wide open with no resolution. While an epilogue might not have made any sense considering the way the rest of the story reads, I am still curious as to what happens afterwards. Being left in the dark like that is disappointing. Overall, it was an okay book and I'm glad I got the opportunity to read it.